Well, I am really trying to be thrifty, and I may have gone too far. Remember those new pillows I made with the really expensive fabric. The one with the gold ribbon swirls was $55 a yd, so I only bought 1/2 yard and that gave me enough for two 18" pillow fronts and since the fabric was 54" wide, that left me with one extra 18" piece. So I thought maybe I could figure out a way to use that last little scrap. Since I decided to use these pillows in the living/dining room, I need to have a table runner that will coordinate with the aqua. 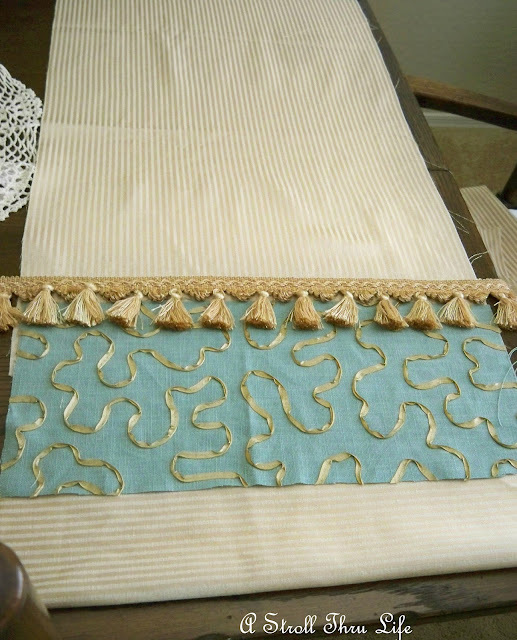 I used a remnant piece of gold and cream stripe for the table topper in the living room and I have 1 1/2 yd piece of that left, so I cut off a 16" wide strip, cut the aqua in half for two 9" pieces, added another small band to the bottom and then found just enough left over fringe in my stash to go across the top of the aqua. I've layed it all out to take a look and see if it is going to work, or have I gone nuts. I have a piece of white that I can use for the backing, so when I get this all sewn together, I will have a table runner for free, plus I will have used up more of my scrap pieces in my fabric stash. That is definitely being cheap, cheap, cheap. Just as I was getting ready to sew this all together, I zigged when I should have zagged and pulled a muscle in my back. So laying on the sofa with a hot pad, and no sewing for now. I will try to make the rounds and visit as soon as it is comfortable to sit at the computer for a while. So far, I am just laying down, I think I really screwed things up good. Oh, well, I will survive. Hope your day is a super one, and be careful how you move. Feel Better Marty! Your table runner will be the perfect coordinating compliment to your gorgeous pillows. That is going to be one fabulous table runner! Take care Marty & I hope you are feeling better soon. Oh no - I am sorry to hear about your back. Back pain is no joke! However, your runner idea is an awesome one! This will look beautiful. Heal fast! What a wonderful idea, Marty! 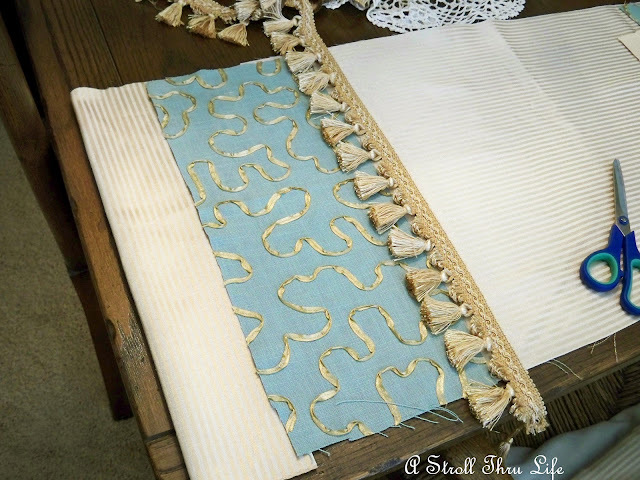 I know the finished result will look fabulous ... and, tie in perfectly with the beautiful coordinating pillows you made! I hope your back feels better soon! Feel better Marty! Love your "free" runner!!! Does not look cheap at all! Sorry to hear about your mishap Marty. I have been in bed for almost a week with Shingles...another kind of backache in my case! Oh, my goodness! Do take care of yourself, dear friend! Your "free" runner looks custom chic!!! Please take a few days of "down time" and don't over ~ do it! I'll be back soon to see how you're feeling! Love the fabrics together. I read another couple of blogs where people are not well and I have a crummy summer cold. I hope you feel better soon. Sorry about your back - Hope it feels better soon. Back issues are no fun. take care and rest and you will be good as new in no time! Oh no Marty...hate when that happens, but maybe it's just a pulled muscle that will heal overnight...hope so. I love the runner...how creative you are, using up all your "stuff" and it all coordinates! I like "frugal"...but then again, cheap works for me too, LOL. What a good feeling to create something so lovely from left over scraps. Hope your back is better really soon. I have been enjoying your blog for quite a while now, and happy that I'm getting email notifications. I look forward to each and every post. Oh, Marty, hope you get better soon! I like where you were going with this! I think it will look lovely with your pillows. Your really made the most of your fabrics!!! So sorry to hear you are in back pain. But you sure put together a beautiful runner before you collapsed! It's going to really look nice. You and Pat at BPM need to start a blogging rehab center! Back pain is terrible. Hope you feel better soon. Can't wait to see that beautiful runner on your table. Oh no, Marty! You take care and just leave things ~ the runner can wait and so can blog visits. Great idea though to use up your scrap fabrics! You just rest and feel better. I'm sure your runner will look great when you have time to work on it. Marty, take care of yourself! You did not go to far with your runner. That was a great idea to use up your scraps! I try to find a use for all of my scraps, I just think it is the right thing to do. If I absolutely can find a use, I will donate it to Goodwill. Your runner is going to be beautiful! Hope you get better soon! It's going to be so pretty when you get it finished! Praying for your back. It's no fun when you can't get around or your in pain. Oh Marty.....don't hurt your back!!! That is a bummer. Hope you are up and about soon, which means in about 10 minutes for you!! I totally know your back pain..it is from sewing...leaning over for too long. I hate that about my back. So sorry to hear that. Keep heating and icing and stretch your quad muscles that helps me everytime. Hope your back gets better quickly. I've practically lived on the heat pad all last week and again today. Low back pain that radiates into the hips. I'm thinking one of the "ritis" brothers may have moved in! Your runner will be lovely. I like the stripe running opposite too! Take care. So sorry about your back. That isn't fun. Love the runner....my master bedroom drapes are made with the stripe fabric and I love it. Hope you feel better soon. That's too bad about your back, I hope you feel better very soon. 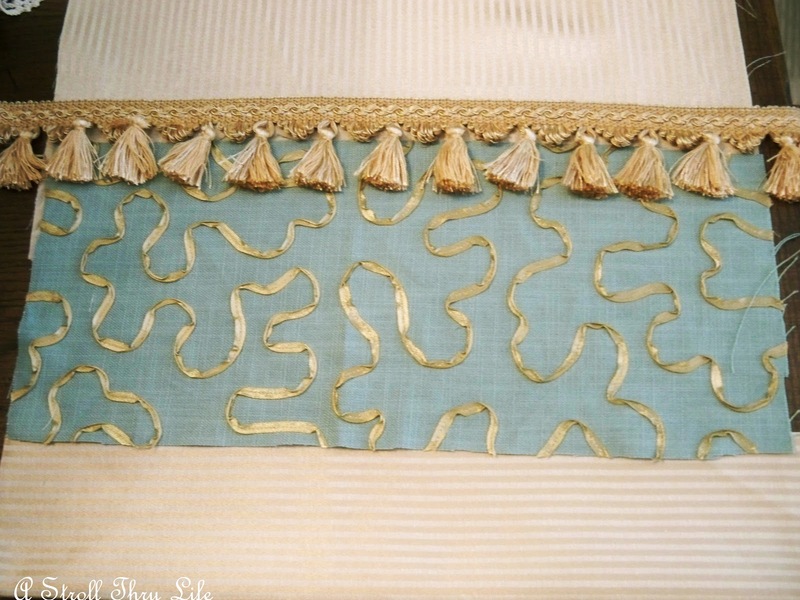 And once you are up to sewing again, that runner will be beautiful! Sorry you've injured your poor back - hope you are soon fully recovered. Hope you feel better soon, Marty. Back pain is not fun. Oh no Marty back pain is the worst! I hope you feel better soon! Sorry to hear about your back...the runner will be gorgeous! So sorry to hear about your back. Back troubles are the worst! I hope you can rest and heal quickly. Slow it down, the runner can wait. Hard to do, I know. The choices you've put together are beautiful though! I love it! Oh, Marty! Take care of yourself! I hope your back feels better soon. The runner is going to be gorgeous! Mixing both materials looks just perfect! Can't wait to see it on your table! I need to hire you but you are PRICELESS! You are my inspiration. I sure hope you are feeling better soon - ouchie! Let yourself rest - body, sould and MIND. 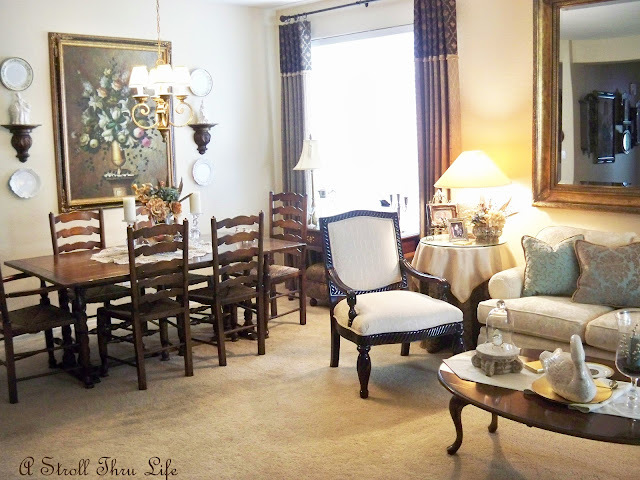 Don't even THINK about decor design - let yourself be immersed in peaceful rest as much as you are able. Hugs and healing prayers for you! So sorry about your back and I hope that you will soon be back up and running. I LOVE your runner idea. It is a great way to get some use out of the expensive fabric scraps and looks absolutely beautiful! Oh yea, and sorry about your back, been there done that, so my thoughts and prayers are with you. Zigging and zagging are hard work! I have pulled muscles in my shoulder area too and I know how much it hurts. Really bad. Take care...you might try some ice alternated with the heat. That works for me most of the time. Feel better! Please post the finished runner when you heal. It looks beautiful! Hope you're feeling better, Marty! I know that chicken soup helped and it looked so good. I can't wait to see the finished table runner. Yea, in using up your stash! !